This is an image of the large-scale radio halo taken by the VLA at 327 MHz (from Owen, Eilek & Kassim). Click on the picture for a larger version (which may take awhile!). This is the full extent of the radio source, about 80 kpc end-to-end. The inner lobes and jet can just be seen as the red structures in the center (and the nuclear black hole sits in the center of this inner structure). This picture thus covers an area larger than the optical galaxy; we are studying the inner region of the Virgo cluster. 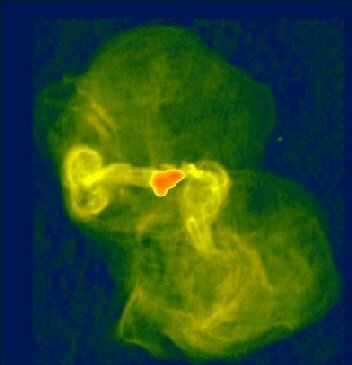 The galaxy, and its radio halo, sit in a large atmosphere of hot, X-ray loud gas (as detected by the EINSTEIN and ROSAT satellites). From this image we can see that the radio halo is a bubble, with a well-defined outer edge, sitting inside the X-ray emitting atmosphere. The bright plumes emanating from the inner lobes tell us that the halo is still "alive", being supplied with energy from the black hole. From our knowledge of the radio jet, we can tell that the jet is pumping at least at much energy into the local atmosphere, as is being lost by that atmosphere to X-rays. This and other evidence tells us, indirectly, that the core of the Virgo cluster is a complex, turbulent, magnetized region. It is anything but well-understood.